As we rolled off the train, the hot Egyptian air hit us hard in the face. A balmy 120 degrees at noon, all we could think about was drinking ice water and hitting the hotel pool. As soon as the sun started to set, we made our way to the docks to barter a felucca ride. There are feluccas all ver Aswan, you just have to bargain your way around to a good deal. For $20 we had our own boat and captain for a few hours. Captain Mohammed even let us take over and sail it ourselves! Ahoy! Feluccas are traditional wooden sailboats used on the Nile around Egypt. Many people hire them out for long trips, between Aswan and Luxor for example. But with our tummy problems due to trying as much local food as possible, i.e. eating street food (big mistake-what were we thinking?!) we had to stick for a shorter evening jaunt around Aswan. We spent a few hours lazily sailing back and forth across the river, making our way through Aswan as the sun set over the Nile. Boats busing locals back and forth would cruise on by, with men and women hanging out on the roofs blasting music and dancing their hearts out. Local boys would swim by floating on a boogie board, chatting to us and practicing their English while water buffalo sipped water on the banks. All I could think about was how dirty that river was! You’d have to throw me in kicking and screaming to get me to swim in it! As the sky turned pink and orange, M and I lounged around on deck, taking it all in. It was so peaceful and relaxing compared to how hectic and loud our trip had been so far! Besides thecamel ride around the Pyramids at Gizaand taking asunrise hot air balloon rideover the Valley of the Kings, the felucca ride on the Nile was one of my favorite activities we did in Egypt. That is until the wind completely died and we had to row our way across the river by moonlight. Typical. If you go to Egypt, you MUST do a felucca ride at some point! 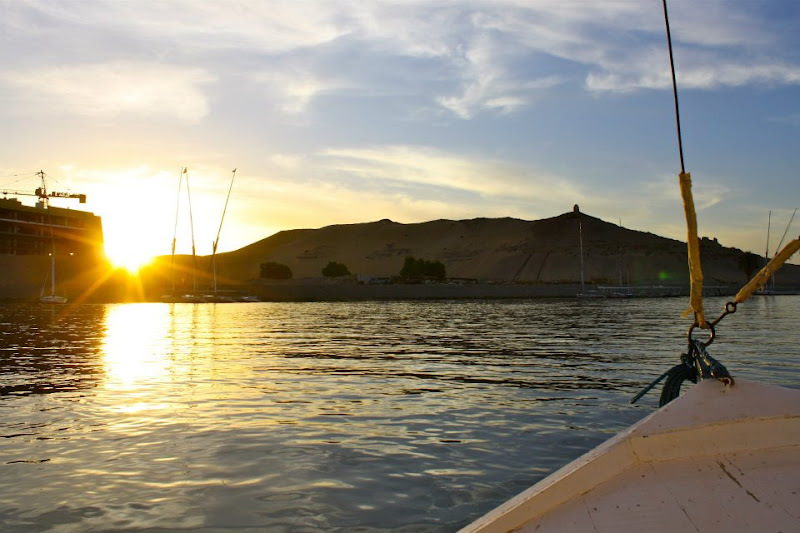 The best place to do it is in Aswan, a smaller Nubian city in the south with beautiful islands and reserves on the Nile. It is also even hotter than Cairo and Luxor (is that possible?) but hanging out on a boat on the river at sunset is the perfect way to beat the heat and relax. It is great, affordable, and romantic! You can do it alone, with friends, or with that special someone, oh la la. Have you ever been to Aswan or Egypt? 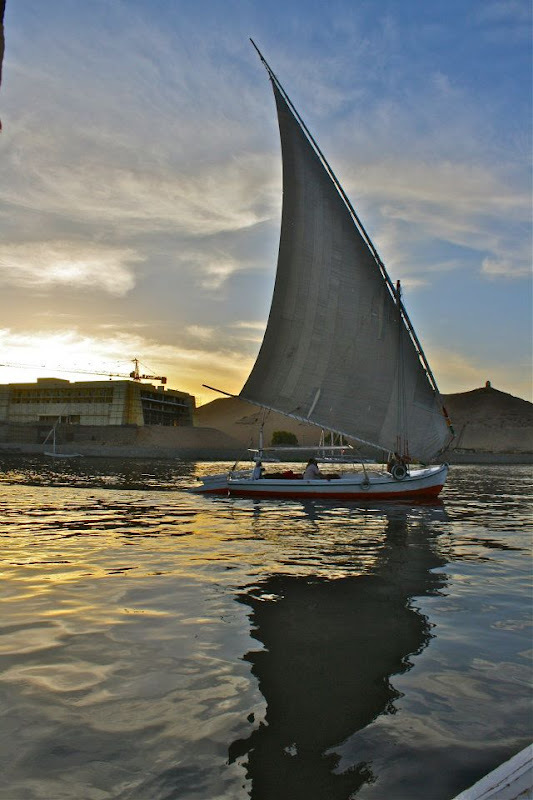 Did you or would you take a felucca ride? Would you swim in the Nile or would you have to be thrown in like me? Welcome to the self hosting WP club – it’s a good one! It’s certainly more work but I think it pays off!